Posted on Wed, Feb 8, 2012 : 8 a.m.
Tu B'Shevat [TOO bay shuh-VAHT] — the Jewish New Year of the Trees — began at sundown last night and continues through today. It is traditional to celebrate the holiday by having a tree planted in Israel; by eating a new fruit; or by holding a seder in which specific fruits are eaten in a particular order, along with the recitation of blessings. It is also customary to enjoy dried fruits and nuts — such as figs, apricots, pecans, walnuts, etc. — although eating any type of fruit is a lovely way to acknowledge the beauty and bounty of trees. According to MyJewishLearning.com: "The Bible expresses a great reverence for fruit trees as symbols of God's... beneficence. Special laws were formulated to protect (them) in times of war and ensure that the produce of trees would not be picked until the trees were mature enough and tithes were given from them." Respect for trees and care for the environment are deeply ingrained in Judaism. Just because the recipe for today's salad is ridiculously simple and only requires four ingredients, don't underestimate the impact of its taste! The brightness of the oranges, the sweetness of the dates, the tartness of the pomegranate molasses ... it's an intensely flavorful combination. 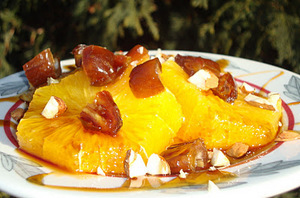 And the almonds contribute a lovely crunch to contrast with the softness of the fruits. Cut the ends off the oranges, then stand them upright and slice off the peels. Turn the oranges on their sides and cut into thick slices, then place onto a serving dish. Sprinkle the dates and almonds over the oranges. Drizzle the pomegranate molasses over everything.